Definition (FMA) Segment of neuraxis that has as its parts gray matter and white matter that surround the central canal. Examples: There is only one spinal cord. Definition (UWDA) Caudalmost subdivision of neuraxis that consists of neural tissue (which is organized into gray matter and white matter) and the central canal (cavity of organ part); it is embryologically derived from the caudal part of the neural tube. 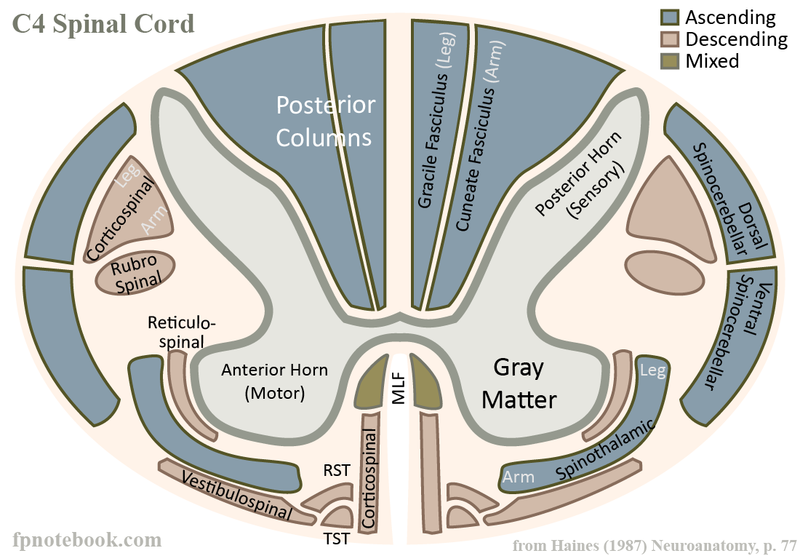 Together with the brain, the spinal cord constitutes the neuraxis. Examples: There is only one spinal cord. Definition (NCI_NCI-GLOSS) A column of nerve tissue that runs from the base of the skull down the back. It is surrounded by three protective membranes, and is enclosed within the vertebrae (back bones). The spinal cord and the brain make up the central nervous system, and spinal cord nerves carry most messages between the brain and the rest of the body. Definition (MSH) A cylindrical column of tissue that lies within the vertebral canal. It is composed of WHITE MATTER and GRAY MATTER. Definition (CSP) that part of the central nervous system which is lodged in the vertebral canal; it is composed of an inner core of gray matter in which nerve cells predominate, and an outer layer of white matter in which myelinated nerve fibers predominate; it is enclosed in three protective membranes, the meninges. This page was written by Scott Moses, MD, last revised on 5/24/2015 and last published on 4/6/2019 .